Two-factor authentication is a two-step login process. In addition to your username and password, you must enter a code that you receive on SMS when you log in. The purpose of this is to add an extra "layer" of security, which means that a stolen password is not enough for someone to break into your account. The advantage of two-factor authentication is that your account is better protected. The downside is that the login process will take a bit longer, since you need to enter a SMS-code in addition to your username and password. Its up to you whether you want to turn on two-factor authentication for your account or not. 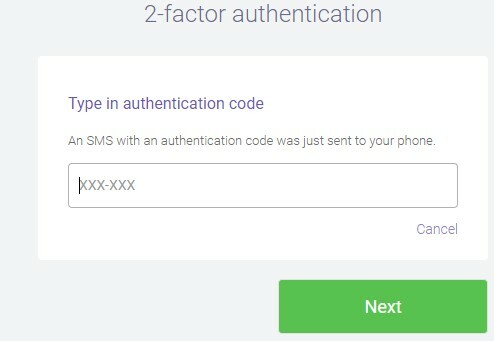 To enable two-factor authentication for your Jottacloud account, go to www.jottacloud.com/web/secure, log in, and click on the "enable" button in the section titled "Secure your account with 2-factor authentication". Once you've done this, you will be asked to enter your mobile number if you have not saved it before. We will ask you to verify your mobile number by sending you a verification code on SMS that you must enter. Once this is done, two-factor authentication is enabled for your account. After turning on two-factor authentication, you will be prompted for a six-digit code in addition to your username and password at each login. The code will automatically be sent by SMS once you have entered your username and password.